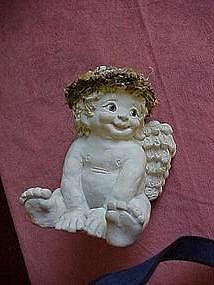 This is one of the largest of the dreamsicle cherubs I have seen before. It is a sitting figurine, but still measures 6" tall. She still has her dried flower halo intact. She is in great condition. Still has her sticker on the bottom, and is signed Kristen 94. She is DC127 "Little Dickens". She is heavy,so when inquiring please send zip so I can get a shipping cost for you.